Das Hostel One Catredal würde ich jederzeit jedem empfehlen der auf der Suche nach dem besten Schlafplatz in Sevilla ist . 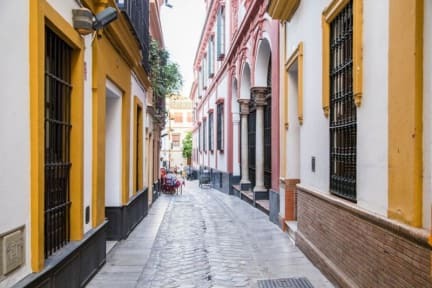 Als ich ankam wurde ich mit einem Kaffee begrüßt und das Personal hat sich sehr herzlich um mich gekümmert und mir viele Tipps rund um Sevilla gegeben. Obwohl ich in einem 6-Bett-Zimmer geschlafen hab waren die Nächte sehr angenehm und ruhig. Abgesehen von der wunderschönen Dachterasse und dem leckeren Free Dinner jeden Abend war mein Highlight der Pub Crawl mit Julian! The staff was really friendly and helpful! The bed and the room were also really nice and you could sine up for free vegetarian/non vegetarian dinner which was also very good! I also enjoyed the rooftop a lot, you could rest for a time and enjoy the sun. It's located in the centre of Sevilla and you can walk easily to many places. I would absolutely recommend this Hostel! I loved the hostel. With the volonters working there, it was always such a great atmosphere. Great activities in the afternoon and of course the free dinner and unforgettable pub crawls! And the roof top bar is wonderful. As a solo traveller you always meet people if you want. Even in the off season. Only bad thing: if you have a room near the lobby, it's quite loud most of the time. But if you get another room, then it's perfect. I would definetely come back! My stay in this hostel was magical, a lot of positive energy and good vibes, really social hostal, i was glad to have such an awesome experience there, made a lot of friends and had really interesting conversations, highly recommendable! Proper rooms, only critic point is no breakfast, but well it's a little one! Great hostel! They offer a lot of free activities and its easy to meet other travellers there. Perfect place if you travel on your own. Richtig gutes Hostel in optimaler Lage mit super freundlichen Mitarbeitern. Die Atmospähre ist richtig gut ind die Sanitäranlagen in einem guten Zustand. Es werden auch viele aktivitäten angeboten, 2 x pro Tag gibts ne freetour für die kulturaffinen und abends für die feierwütien einen Pubcrawl. Würde hier jedes mal wieder hinkommen. We came to Sevilla to finsh our Spain - Adventure. As we arrived in the Hostel One Cathedral, we were immediately sure we made the right decision. The Room was clean, the staff was superfriendly and the bath was as clean as possible. The Cathedral of Sevilla is superclose, just as lots of good tapas bars. They also offer freetours if you don‘t want to get lost in the first day. We enjoyed our stay and would return to this nice place on our next Spaintravel!